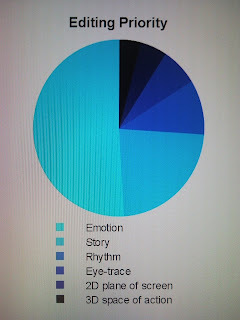 "An ideal cut (for me) is the one that satisfies all the following six criteria at once: 1) it is true to the emotion of the movement; 2) it advances the story; 3) it occurs at a moment that is rhythmically interesting and "right"; 4) it acknowledges what you might call "eye-trace" - the concern with the location and movement of the audience's focus of interest within the frame; 5) it respects "planarity" - the grammar of three dimensions transposed by photography to two (the questions of stage-line, etc. ); 6) and it respects the three-dimensional continuity of the actual space (where people are in the room and in relation to one another)." Taken out of "In the blink of an eye" an essay about film editing by Walter Murch.